The Earth's solid surface and moderate climate may be due, in part, to a massive star in the Sun's birth environment, according to new computer simulations of planetary formation. 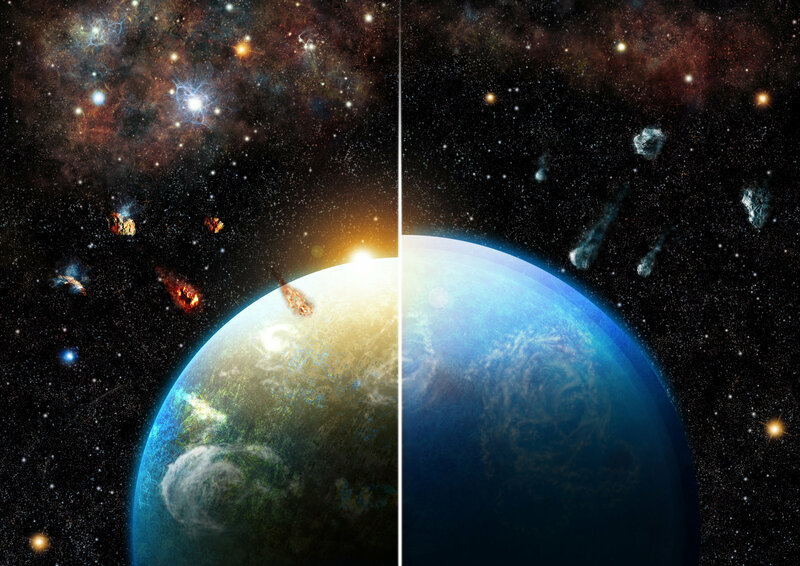 Without the radioactive elements of the star injected into the early solar system, our home planet could be a hostile ocean world covered in global ice sheets. 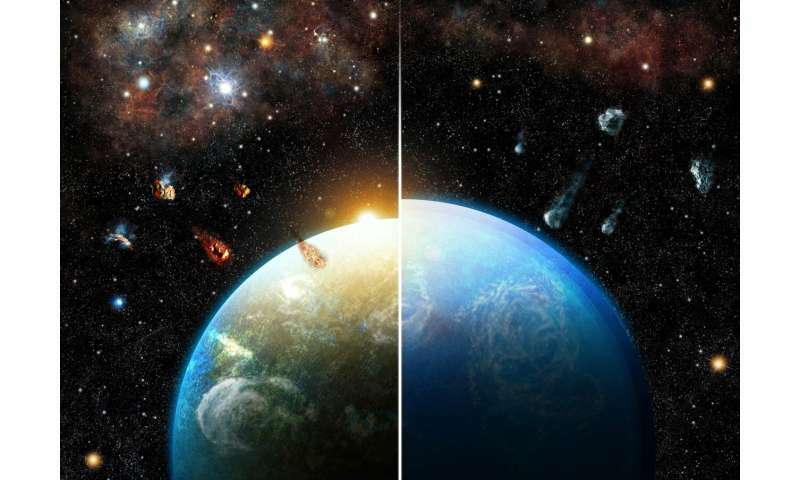 "The results of our simulations suggest that there are two types of qualitatively different planetary systems," said Tim Lichtenberg of the National Center for Competition in Research Planets in Switzerland. "There are those similar to our solar system, whose planets have little water, and those in which primarily oceanic worlds are created because there was not a massive star when its host system was formed." Lichtenberg and his colleagues, including astronomer Michael Meyer of the University of Michigan, initially were intrigued by the role that the potential presence of a massive star played in the formation of a planet. Meyer said the simulations help solve some questions, while raising others. "It's great to know that radioactive elements can help dry the wet system and have an explanation of why planets within the same system would share similar properties," Meyer said. "But radioactive heating may not be enough, how can we explain our Earth, which is very dry, in fact, compared to the planets formed in our models? Maybe having Jupiter where it was also important to keep most of the icy bodies of the internal solar energy system. " Researchers say that while water covers more than two-thirds of the Earth's surface, in astronomical terms, the internal terrestrial planets of our solar system are very dry, fortunately, because many good things can do more harm than good. All planets have a nucleus, mantle (inner layer) and crust. If the water content of a rocky planet is significantly higher than on Earth, the mantle is covered by a deep global ocean and an impenetrable ice sheet at the bottom of the ocean. This avoids geochemical processes, such as the carbon cycle on Earth, that stabilize the climate and create surface conditions that lead to life as we know it. The researchers developed computer models to simulate the formation of planets from their building blocks, the so-called planetesimals, rocky bodies probably of dozens of kilometers in size. During the birth of a planetary system, planetesimals form in a disk of dust and gas around the young star and become planetary embryos. As these planetesimals are heated from the inside, part of the initial water ice content evaporates and escapes into space before it can be sent to the planet itself. This internal warming may have occurred shortly after the birth of our solar system 4,600 million years ago, as suggested by the primitive traces of meteorites, and may still be in progress in many places. Just when the prototo-Sun was formed, a supernova was produced in the cosmic neighborhood. The radioactive elements, including aluminum-26, were fused in this massive dying star and injected into our young solar system, either by excessive stellar winds or by means of supernova ejection after the explosion. The researchers say that the quantitative predictions of this work will help space telescopes of the near future, dedicated to the hunting of extrasolar planets, to track possible traces and differences in planetary compositions, and refine the predicted implications of the dehydration mechanism Al-26 . They are waiting impatiently for the launch of the next space missions with which you can see exoplanets the size of Earth outside our solar system. This will make humanity closer and closer to understanding if our planet is unique or if there are "an infinity of worlds of the same type as ours". His study appears in. Nature astronomy. Other researchers include those from the Swiss Federal Institute of Technology, the University of Bayreuth and the University of Bern. From dust to pebbles, to planets: information about the birth of a solar system.